This website allows you to assess different scenarios concerning the evolution of climate change policies discussed at the UN COP-15 and COP-16 Conferences. It evaluates the consequences of such policies on economy, energy and climate. For instance, You may evaluate the consequences of a failure of negociations during COP-16, of a delayed international accord, of a limitation of emissions permits exchange or of an optimal international cooperation. If you don't know where to begin, this link will probably help you. The website is organized in five sections that can be accessed from the main menu on the central horizontal bar. To assess the proposals discussed at the COP-15 and COP-16 negotiations it is necessary to consider the interactions between the economy, the energy system and the climate dynamics and uncertainty. To do that, we use three complementary models, TIAM, GEMINI-E3 and GENIE, and propose some elements to take into account uncertainty in those models. It is possible to explore several scenarios, including what could happen if the negotiations fail, or if an agreement is limited to OECD or G20, compared to what could be achieved if a global agreement were reached. Climatic, economic and technological data are presented for each scenario. It is possible to explore several scenarios, including what could happen if the negotiations fail, or if an agreement is limited to Annex1 coutries or delayed to 2050, compared to what could be achieved if a global agreement were reached. Climatic, economic and technological data are presented for each scenario. 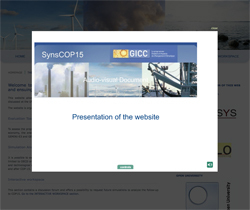 This section contains a discussion forum and offers a possibility to request future simulations to analyze the follow-up to COP15. Go to the INTERACTIVE WORKSPACE section.